The combination of excellent personalized service, natural serenity, customer relationship management, experienced and highly trained hospitality personnel plus high security system makes Diani forest lodge the unequaled top hospitality service provider in this part of the Kenyan coast and indeed very ideal for retreats, holidaying and conferencing. 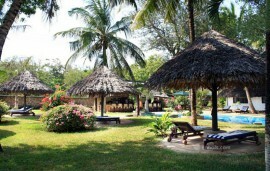 Diani forests lodge enjoys wide varieties of support amenities such as internet connectivity, cyber cafe services, taxi services, ample and secure parking as well as outside services catering. The lodge has 72 rooms which are spacious and have 144 large beds which offer total relaxation and comfort. The rooms are fitted with fans, mosquito nets and water showers. The rooms are categorized into single and double rooms and can accommodate a maximum of 288 people. Diani forest lodge is endowed with 5 spacious conference halls, which can accommodate 250 people at one given time. The halls are fitted with modern conference facilities which include LCD, projectors flip charts, etc. The conference facilities are customer centered and are very ideal for team building, business retreats and strategic planning meetings, CBO and NGO training group workshops and training. The lodges’ romantic evergreen garden is ideal for wedding receptions and other social parties. No TripAdvisor® Reviews available for this hotel yet.